There is no better way to complete your landscape design than the addition of a brick wall enclosure. Aside from providing privacy and a feeling of security, a brick wall adds a dramatic finishing touch that complements the homeowner's architectural vision. Your garden becomes a showplace when protected with a retaining wall created with Belden Brick. Custom design your own patio enclosure or create a private sitting area in your backyard with planters made from colorful, textured brick. The possibilities are unlimited so let your imagination take over. 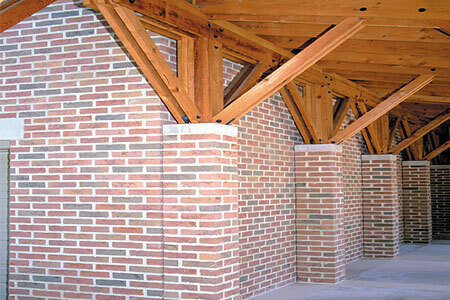 The charm and beauty of a Belden Brick enclosure will add to your property value. It improves the overall curb appeal of your home and can be customized to harmonize with your existing or new architecture. Whether straight lines or graceful curves form the outline of your property, the versatility of brick makes it the perfect building material for your landscape design project.